2016 will be remembered as the year in which the European Union definitively broke the civilisation pact on which it was founded after the Second World War. For years, after the great Lampedusa shipwreck on 3 October 2013, the EU has tacitly allowed the deaths at sea of thousands of refugees fleeing towards the European coasts, having been unable to guarantee safe and legal access routes to the Union. This year, in 2016, the EU has taken a further step towards barbarity: not only has it closed its internal borders by dismantling the Schengen area, but it has consciously decided to send refugees back to the war zones from which they had previously fled, and from which they are still escaping. The agreement with Turkey signed on 20 March 2016, which enables the mass deportation of refugees who manage to reach Greece, cannot be interpreted in any other way. Thousands of these returnees are sent back by the Erdogan regime to the Syrian war zones from which they had initially escaped: a deportation that violates national, European and international laws. The dirty work is entrusted to its Turkish ally, but it is Europe itself that takes the responsibility for this collective refoulement, bringing about the deadly triangulation of forced returns. The European Union’s actions will one day be judged as a crime against humanity. These manoeuvres will also have proved useless, because those who are trying to flee from wars and dictatorships will not stop – and cannot stop – trying to escape. With the Balkan route closed, inevitably other escape routes will open or re-open: starting from the Central Mediterranean route, which arrives at the Sicilian coast and the island of Lampedusa. At the same time the European Union’s policies generate illegality while remaining completely ineffective: it is not the traffickers who will have to pay the price, but the refugees and the whole of Europe. Europe is paying a high price in terms of political and moral prestige, while the unificatory project born after the Second World War is beginning to disintegrate. The incentives to remain united and to show solidarity will decrease, the far right and racisms will take advantage of the upheaval. Here it should be remembered that Greece, brought to its knees after six years of absurd austerity, was also left abandoned and without financial help in relation to the refugee crisis. The vicious circle is diabolic: if the hotspots in the Greek islands are unable to appropriately welcome and register refugees, it is because the European Union does not assist Athens economically, with the excuse that the hotspots and the reception centres are not organized and functioning as they should be. But if they are not working, it is because the money is not arriving – like a dog chasing its tail. To this we have to add the walls erected on the borders of Greece and the former Yugoslav Republic of Macedonia (Idomeni) and the refusal of nearly every EU member state (except for Portugal) to agree to accept the refugees who managed to survive and land safely on the shores of Greece. In this context, the lies circulating in the countries of the Union about refugees should not be forgotten. There is talk of invasion and of a biblical exodus towards Europe. But when studying the figures all one needs to do is look at the evidence. With 60 million refugees in the world, one million has in 2015 arrived in the countries of the European Union. It is just 1.2 percent of the EU population. The majority of Syrian refugees today live in Lebanon, Jordan and Turkey. At this point I would like to summarize the main points of my political action within the European Parliament. On 3 October 2014, one year after the Lampedusa shipwreck, I went to the island with a delegation from the parliamentary group GUE/NGL. I condemned the replacement of the Italian Mare Nostrum operation with the Frontex Plus operation, later renamed Triton, which would have carried out checks and patrols, rather than search and rescue, and without venturing into international waters. Triton had the obvious purpose of encircling Europe with a wall, and to ignore (in fact: accept) the deaths at sea of migrants and refugees. It has been guilty, since 2013, of what Hermann Broch has called, after the end of German Nazism, the “crime of indifference”. “Human beings are not only the victims of wars”, I said at the time, “but also of truth and legality”. More precisely, a series of articles of the European Charter of Fundamental Rights, beginning with Article 2 (the right to life) and Article 19 (the prohibition of refoulement). The Lisbon Treaty is also violated (Article 80), which requires financial solidarity between Member States “whenever necessary”. However Mare Nostrum was not due to have been replaced either by Frontex Plus, or by additional operations such as Triton, Poseidon or Hermes. Put simply, there would have been no more search and rescue missions beyond 12 miles of the coast. “I draw two conclusions”, I wrote on 4 September 2014, addressing myself to the executive director of Frontex, Mr. Gil Arias-Fernandez, invited to present the activities of Frontex in the Mediterranean before the Commission of Civil Liberties, Justice and Interior Affairs of the European Parliament (LIBE). “First: Italy is left alone. Second: Mare Nostrum is over and there will be more deaths in the Mediterranean. I ask Dr. Fernandez if you are aware that these are the conclusions which we have to draw, and that two articles of our treaties are violated: Article 80 of the Lisbon Treaty, which requires solidarity and the distribution of resources, including financial, between Member States in case of necessity, and Article 19 of the Charter of Fundamental rights which prohibits the refoulement policy”. I received no answer, and following Italy as we have seen, Greece also has been left abandoned by Europe, and with an economy already shattered by the Troika’s economic memorandum. In early December 2014, Klaus Roesler, director of the Frontex operative division at the time, wrote a letter to Giovanni Pinto, central director of the Immigration Department and of Border Police (IDBP) at the Ministry of the Interior, which became public as a result of a journalistic leak. Roesler was saying that he was worried “about repeated interventions ‘out of area’ in the Mediterranean beyond 30 nautical miles from the Italian coasts”. The heart of the scandal was something that happened a month earlier. On November 20, after having received a series of requests for rescue at sea, the Operations Control Centre of the IDBP in Rome gave instructions to a Frontex unit to go to the reported location and verify the possible presence of boats in distress. “Frontex maintains that a satellite phone call cannot be considered in itself a search and rescue event—we read in the letter—and therefore recommends that steps should be taken to investigate and verify, and only later, in case of difficulty, should another maritime unit be activated. Moreover, Frontex considers unnecessary and inappropriate in terms of cost the use of an offshore patrol vessel for these initial verification activities out of area”. This was a genuine warning letter in which the Director of Frontex at the time advised that “the instructions given to the ships to move into areas placed outside of the Triton operative area to assist vessels in distress are not consistent with the operational plan, and unfortunately will not be taken into consideration in the future”. In reference to this, I wrote a letter to the newly appointed Director of Frontex, Fabrice Leggeri, while the UNHCR was noting that in 2014 no less than 3,419 people had died in the Mediterranean in an attempt to reach Europe. I was asking for explanations about what Gil Arias-Fernandez had admitted in an interview with the Spanish newspaper El Diario—that the aim of Frontex was to “prevent illegal entries […] since it had no mandate to rescue at sea”. In this case also I have received no answer. In the first weekend of April 2015, the Italian authorities announced that they had saved around 2,800 migrants and that the rescue operations had been conducted mainly by Italy in international waters, while the European Operation Triton had continued to patrol the area within thirty miles of the Italian coast, far from the area where the boats in distress needed help. A few days later, on April 12, a boat capsized causing 400 deaths. I wrote an open letter to Commissioners Avramopoulos, Mogherini and Timmermans, co-signed by 24 colleagues from different parliamentary groups (a figure that would have been much higher if we did not have the urge to send the letter immediately). We were asking the EU to take its responsibility regarding the search and rescue operations in the Mediterranean seriously. “The current emergency situation will continue to worsen. In the meantime, not even one of the four areas that the European Commission has spelled out for the next Agenda for Migration (expected in May) addresses the need for concrete search and rescue operations in the Mediterranean”. A few days later the 18 April shipwreck occurred. There were more than 800 deaths. I launched an appeal signed by many intellectuals and activists in which we asked to substitute the word “emergency” with “urgency”, giving reality to the name it deserved. “We are facing war crimes and extermination in peace times. The crime is not sporadic but systemic, and must be put at the same level as prolonged wars and famines,” we said then. From the beginning of July, the deaths at sea resumed. Castaways in the Sicilian Channel were not rescued by Frontex—the European Union was absent—but by the three private humanitarian ships provided by the Migrant Offshore Aid Station (Moas), Doctors without Borders and Sea-Watch, along with the units of the Italian Coast Guard and Navy, and the few ships left by the Member States, whose organic membership to the Triton mission was far from clear, since on their respective government websites they were said to be available to individual states, under the coordination of the Italian Coast Guard. The same applied to the Irish ship LÉ Niamh, whose rescue work was not referred to as related to the Triton-Frontex operation but to “joint operations with the Italian Navy”. Looking back—as the Forensic Oceanography report requires us to do—we have an idea of how in just two and a half years, we have passed from hypocritical declarations on Lampedusa to active indifference in front of the 350 children drowned at sea following the death of Alan Kurdi, as if this were a natural catastrophe that does not affect the political sphere. 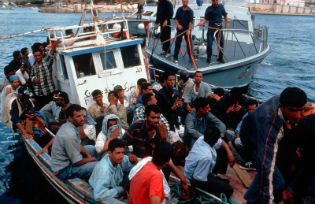 The more European institutions have talked about rights and humanity, the more they have proceeded towards a subtraction of means, personnel, financial assistance for search and rescue, engaging in agreements with Third Countries not reliable from the point of view of respect for fundamental rights (the Rabat and Karthoum processes) and in the deliberate and shameless outsourcing of refoulement culminating in the EU-Turkey agreement. Alternative ways exist to address the issue of refugees and migrants. We need to open safe and legal humanitarian corridors and understand that smugglers and gangs proliferate in the absence of such corridors. Illegality always propagates in absence of legality, as Italy knows well in its anti-Mafia policies. We need to mobilize political imagination to overcome the cage imposed by the Dublin regulations, to assist the most vulnerable countries like Greece and Italy, to not criminalize the refugees, the migrants, and the many associations that seek to ensure their safety and their right to flee from countries rendered uninhabitable by wars and devastation: wars and devastation for which the Europeans, along with the US administration, are in large part responsible, within the “chaos arc” that extends from North Africa to Afghanistan. Finally, we have to mobilize thinking and actions, taking a long-term view on what is happening. In front of our eyes Europe is changing, we have to start seeing it as a new melting pot of peoples, knowing that most of the refugees are expected to remain with us for a long time and to become our future co-citizens. There is talk of a migrant crisis, when we are actually dealing with a refugee crisis, triggered by European misanthropic inertia. There is talk of crisis, when we are actually being offered an opportunity- a kairos- not to be missed. Barbara Spinelli is an Italian writer and journalist. She has been a columnist for Corriere della Sera, La Stampa and La Repubblica on issues of international and European politics. Since June 2014, she is member of the European Parliament in the GUE/NGL group. Her latest book is: “La sovranità assente” (Absent sovereignty), Einaudi 2014. She blogs at http://barbara-spinelli.it/.